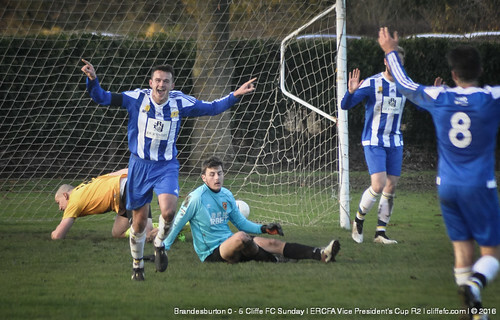 Cliffe FC Sunday are through to quarter-final of County Cup, with a dominant 5-0 away win at Brandesburton. Saturday’s still aren’t much to report, a 6-0 defeat at Rawcliffe for the First Team. Cliffe FC Sunday made the near 80-mile round trip to face Brandesburton in North Frodingham – a picturesque morning and nice pitch welcomed the away side – even arriving 30 minutes before the home side! From kick-off it was obvious Cliffe were going to dominate from start to finish, and it was only a matter of time before the deadlock was broken – but Cliffe just couldn’t seem to do so, Aidy Wood having a forgettable day in front of goal on his comeback. A penalty got Cliffe on their way, Dan Collins powering the ball past the ‘keeper for 1-0. Trotting up for a corner, Tom Hogg scored a deft-flick off his boot to make it 2-0 before the break. Cliffe comfortable, but job not done. Second half, Cliffe turned it on once more, Kieran Dinsdale scoring with a shot that nestled in the far bottom corner for 3-0. Layton Hallam in his sitting midfield role, apparently in a French international style as stated by Hallam himself, earned him MOTM award. Hogg had another, this time a cheeky back-heel that ended up in the other bottom corner for 4-0, Hogg now chasing a hat-trick. Hogg’s trick evaded him, but scoring wasn’t complete as Glynn Richardson scored his third in two games – his shot taking an age to go in for 5-0, FT.
A welcome win for Jackson Lucitt’s side, a morale boost, and a dominant performance to go along with the win. A last-8 place in the County Cup, along with a place in the later stages of the York FA Cup. Cliffe FC lose 6-0 at Rawcliffe, a poor first half leaving their much improved second half performance too steep of a mountain to climb. Billed as a six-pointer, Cliffe just didn’t turn up – figuratively and literally – some players falling foul of an erroneous away ground postcode, and the developing first half performance that saw Rawcliffe run up a comfortable 4-0 half-time score line. 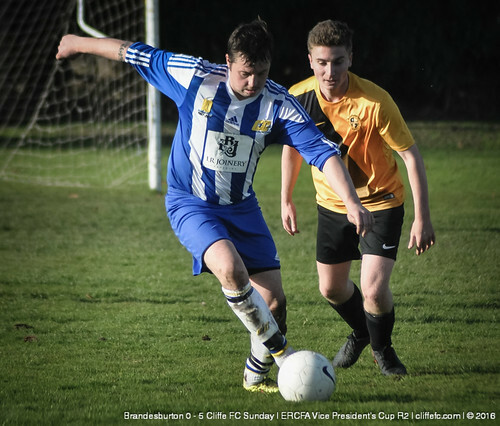 Cliffe improved second half, and had some scoring chances of their own, but didn’t get themselves on the scoresheet, and after being caught for Rawcliffe’s 5th the wind firmly taken out of Cliffe’s sails – Rawcliffe added a sixth before full-time. MOTM: Phil Newstead. A growing task stares Cliffe in the face, and it’s going to take a big effort from the existing squad and hopeful additions as 2017 rears it’s head. Next week, its Hemingbrough United at Oxen Lane.